The Ashland county snowmobile trails are now closed for the 2019 season. The Tri-county corridor remains open. As always please follow the snowmobile trail rules and regulations. Stay on trail, as much of the Ashland County snowmobile trail system uses private property and could be lost if the property owners experiences issues. The most common complaints are snowmobiles not staying on trails or going off into fields that are not part of the trail, and loud noise from non-stock muffler systems. Respect the trail system so that it remains open. As always operate with everyone’s safety in mind and report any hazardous trail issues that are observed to the Ashland County Sheriff’s Department (715-682-7023 opt 1) so that it can be forwarded to the appropriate service. The Tri-County Corridor is open from Superior to Ashland. There are still several areas on the eastern end that require attention but all known hazards have been identified and marked. Use caution when approaching ribbons, barricades, and cones. Important reminders: There is no snowmobiling allowed from Ashland to Bad River/Odanah as snowmobiling is not permitted on reservation land. However, snowmobiling is allowed from Bad River east to the Upper Peninsula of Michigan. If you would like to receive an Ashland County Snowmobile map, let us know and we will mail one out to you! Call us at 715/682-2500 or toll-free at 1-800-284-9484. Click here for the City of Ashland snowmobile trail routes. Click here for Bayfield County Trail conditions. 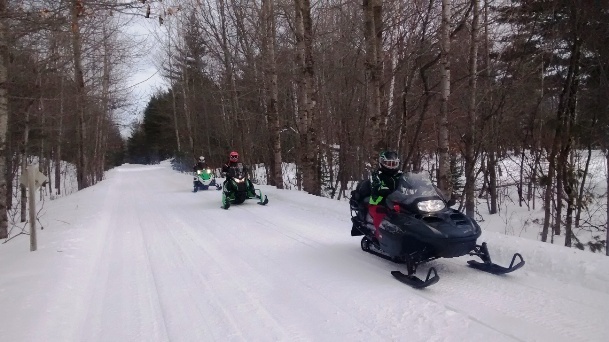 Snowmobilers enjoy the well-maintained trails near Clam Lake. 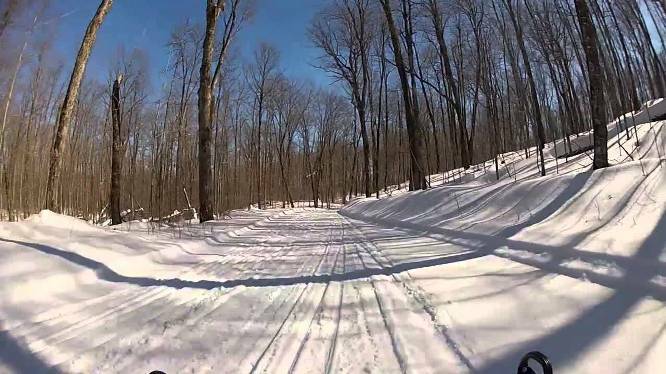 Ashland County offers more than 220 miles of groomed snowmobile trails. NOTE: The Tri-County Recreational Corridor, a 62-mile stretch of abandoned railroad right-of-way running from Ashland to Superior, is ALWAYS OPEN. 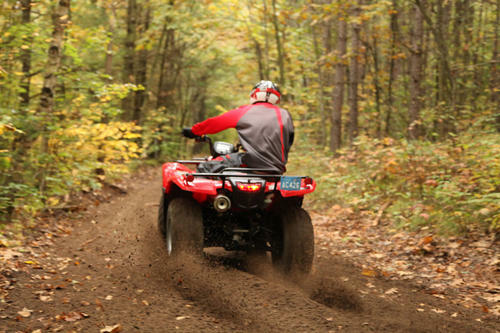 ATV routes and other trails designated by towns under state law are not affected by seasonal closures. Trail users should check local regulations for trails they plan to use. In the City of Ashland, ATVs are NOT allowed on the 5th Street Corridor. Click here for a copy of the City of Ashland ATV Routes. This is an 11 x 17 PDF and will take a moment to download. There are NO Golf Carts or Go-Carts allowed on any of the trails!!!!! Snowmobiling in Ashland County is always an exciting adventure! The Northwest Wisconsin ATV & Snowmobile Corridor Trail Map features Ashland, Burnett, Douglas, Iron, Rusk, Barron, Chippewa, Washburn, Price, and Sawyer counties. This map will help you plan a trip to Northwest Wisconsin, and individual county maps will help you navigate the trails. See for yourself all of the great places you can visit on the seat of an ATV or snowmobile. Click here or on the map cover image to the left to view the digital Northwest Wisconsin ATV & Snowmobile Corridor Map. To order your FREE print copy of the Northwest Wisconsin ATV & Snowmobile Corridor Map, click here. Click here for the Bayfield Recreation Report. Effective July 1, 2015, Wisconsin snowmobile registration will cost $30.00 for three years. In addition, all snowmobiles will be required to have an annual trail pass to operate on a public trail or corridor. Trail passes will cost non-club/non-Association of Wisconsin Snowmobile Clubs members $30.00 and can only be purchased through the DNR. Members who belong to both a snowmobile club and the AWSC will be able to buy the trail pass for $10.00. For more information on the Wisconsin Snowmobile Trail Pass, please visit the AWSC website at www.awsc.org or the DNR website at dnr.wi.gov. Ashland County Snowmobile Trails traditionally close mid-March if conditions permit they will remain open until March 31st. The Northern Great Lakes Visitor Center is a great place to stop on your snowmobiling journey. The Center offers a special area to warm or dry your gloves and hang your helmet while exploring the facility’s displays and climbing the five-story observation tower which showcases the area. The Visitor Center is located on County Highway G, off U.S. Highway 2 near the Tri-County Recreational Corridor. In addition to snowmobiling, Ashland offers cross-country skiing, hiking, snowshoeing, ice fishing, and sledding. And be sure to check the calendar listings on this website for information on our upcoming outdoor events. At this time the Tri-County corridor is open. According to the Forest Service in Ashland County ATV Trails in Ashland County are now open (May 1st). We ask you to use discretion when you ride as we have received a lot of rain and may be soft. Thank you! If you would like an ATV/Snowmobile Map/Brochure for Ashland County, let us know and we will be happy to mail one out to you. Call us at 715/682-2500 or toll-free at 1-800-284-9484. Or you may view the ATV/snowmobile trail map in PDF form here. For the most part, utility vehicles (UTVs) can operate on the same trails as ATVs, including the Tri-County Recreational Corridor, but there are some restrictions. UTVs can only be driven on gas tax roads, such as County F, or designated municipal routes which are marked with a green sign bearing a white silhouette of an ATV/UTV. ATV and UTV operators born on or after Jan. 1, 1988, and who are at least 12 years old for ATVs (and at least 16 years old for UTVs) must complete an ATV/UTV safety certification course in order to operate on public ATV/UTV trails and areas in Wisconsin. 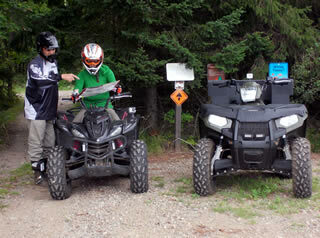 DNR recreational safety specialists recommend all ATV and UTV operators complete a safety course. For more information, visit the DNR website or call the DNR toll-free at 1-888-936-7463. The Wisconsin DNR Call Center is open from 7 a.m. to 10 p.m. seven days a week. NOTE: There is a 65-inch width restriction on ATVs and UTVs within the boundaries of National Forest lands. The Dead Horse Slough Trail Head is located on the north side of State Highway 77, next to the Dead Horse Slough. There is a small gravel parking lot for about 6 cars. It is possible to park a trailer in the lot, but turning space is limited. From Cable, drive east on County Highway M 20 miles to Clam Lake. Turn left (east) on State Highway 77 and drive 2.7 miles to the trailhead. From Glidden, drive north on State Highway 13 for 3 miles. Turn left (west) on State Highway 77 and travel 11.3 miles to the trailhead. Click here for a copy of the Dead Horse Run Trail Map. Annually, all trails in the Chequamegon-Nicolet National Forest and the Dead Horse Run are closed to ATV use from March 15th to April 30th. The Tri-County Corridor is always open for travel. Dirt bikes (this means motorized, two-wheeled cycles that are not licensed road bikes) are allowed on the Tri-County Corridor during months with no snow. Dirt bikes are never allowed on the county’s designated ATV or snowmobile trail routes.